Over the Moon: The Broadway Lullaby Project is both a timeless benefit effort and a uniquely compelling multimedia experience. The ambitious project—which incorporates a two-CD, 26-song set; a lavishly illustrated hardcover book of 17 songs from the album; a corresponding e-book encompassing the entire collection; and a documentary film—gathers many of contemporary musical theatre's greatest composers and vocalists, as well as illustrators, all of whom have donated their talent to deliver an emotionally affecting set of new lullabies, some written specifically for this project. The project will raise money for such respected breast cancer charities as the Breast Cancer Research Foundation and Young Survival Coalition. Over the Moon: The Broadway Lullaby Project's roster of world-class vocalists features some of Broadway's most respected and popular performers, including Anastasia Barzee, Michael Cerveris, Victoria Clark, Raul Esparza, Sutton Foster, Brian D’Arcy James, Rebecca Luker, Kelli O’Hara, Donna Murphy, Anika Noni Rose and Vanessa Williams. The stellar assortment of singers is matched by the original contributions of such esteemed composers as Rupert Holmes, Tom Kitt, Henry Krieger with Bill Russell, Bobby Lopez with Kristen Anderson Lopez, Jill Santoriello with John Patrick Shanley, Stephen Schwartz, David Shire, and Nona Hendryx with Marva Hicks and Charles Randolph-Wright. Meanwhile, the project's book component also features a distinctive cover illustration by fabled cartoonist/playwright Jules Feiffer, along with a foreword written by stage and screen legend Julie Andrews and her daughter Emma Walton Hamilton. Among the illustrators lending their talents are R. Gregory Christie, Richard Egileski, Betsy Lewin, Anna Louizos, Marc Simont, Neil Waldman, Tony Walton, and Paul O. Zelinsky. The project has been documented in the form of a short film that tells the story of the Broadway Lullaby Project from conception to completion. Through interviews and rare behind-the-scenes footage, Peabody and Emmy Award-winning documentarian Barbara Rick and Out of The Blue Films, Inc. chronicle the inspiration, rehearsals, recording sessions, and artistic processes of many of Broadway’s brightest stars, world-renowned jazz musicians, and our most-loved illustrators—all united to combat breast cancer through the comfort and beauty of music and art. 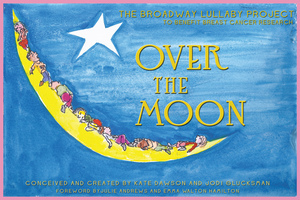 Over the Moon: The Broadway Lullaby Project is the product of the passion and dedication of the album's co-producers, Kate Dawson and Jodi Glucksman, both veterans of New York's theatre community. It was Dawson, a versatile singer, actor, and writer with extensive Broadway and off-Broadway experience as well as an acclaimed one-woman show to her credit, who initiated the project. When she became pregnant with her first child in 2010, Dawson's thoughts turned to her cousin Jill, who lost her battle with breast cancer in 2006 at the age of 45. Dawson spoke to many friends about the idea, including Jodi Glucksman, a respected playwright and dramaturge who had been profoundly affected by breast cancer: When she was 14, she lost her grandmother to the disease. Her mother and mother-in-law are both survivors, and her sister-in-law is a breast cancer surgeon. Moved by the project's philanthropic and creative goals, she signed on as co-producer. The idea for a children’s book of illustrated lyrics seemed a natural companion to a collection of lullabies. That’s when Barbara Aronica, a lifelong friend of Glucksman’s, got involved.” Aronica is an award-winning book designer with more than three decades of experience; she is also a cancer survivor. Aronica, in turn, enlisted veteran publishing executive David Wilk, who signed on to publish the book. Together they created a dream list of illustrators and set about soliciting contributions from them. Pierson worked closely with the singers to maintain the album's intimate focus. The resulting album marks a historic convergence of inspired music and an inspiring cause, making The Broadway Lullaby Project a one-of-a-kind classic that will speak eloquently to listeners of all ages. Public Interest Projects serves as the fiscal sponsor for the Broadway Lullaby Project. Public Interest Projects is a 501(c)(3) public charity with a 25 year history of providing fiscal sponsorship for projects working toward a society that ensures justice, dignity and opportunity for all people. For more information about Over the Moon: The Broadway Lullaby Project, contact Regina Joskow (regina@missingpiecegroup.com) or Gaby Alvarez (gaby@missingpiecegroup.com) at the Missing Piece Group, 862-234-0801.